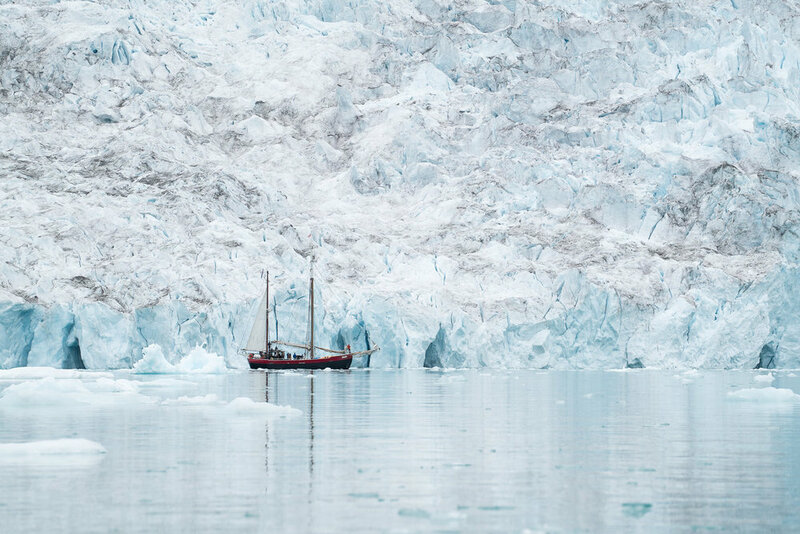 Join us in Greenland, aboard the sailing yacht Arktika with a small group of only seven guests, to explore the striking landscapes, ice-filled fjords, sea life, and small iconic villages nestled in protected harbors along East Greenland’s rugged shoreline. With only 3,500 inhabitants scattered along a 1,600-mile coastline, this pristine wilderness is known for spectacular scenery and breathtaking beauty. We’ll view the big Sermilik icefjord, cruise the waterways, and visit small iconic villages such as Tiniteqilaq, Kummiut, and Sermiligaaq. We’ll drop anchor in secluded remote locations among gorgeous seascapes and fjords, with the gentle lapping of water against the ship’s hull to lull you to sleep. Because early autumn in the Arctic is the best time for the Northern Lights, we hope to see them dance and photograph them in their multi-color glory among the stars. Over seven days and six nights aboard Arktika, we’ll experience incredible scenery with a group of like-minded photographer-traveler-adventurer who want to get great shots while improving their skills. You will get plenty of instruction in the field and in the digital darkroom. Aboard Arktika, which will serve as our “mobile camp,” you will experience the crew’s incredible hospitality along with gourmet meals, comfortable warm bunks, and friendly engaging conversation. Arktika is a Dutch-built ketch-rigged oceangoing sailing yacht that is fully equipped and certified to sail around the world. She has a comfortable deckhouse, a spacious saloon, large galley, and four guest cabins. The sailboat has good central heating, hot and cold water, heads (toilet) and shower. There is 220V electricity to charge batteries and other electronic devices. Ready for an amazing arctic adventure? Read on. living on board the sailboat. This itinerary is flexible, and may be adjusted based on weather, light conditions or other factors. Our goal is to get you to the best places with the best light to make great photos. 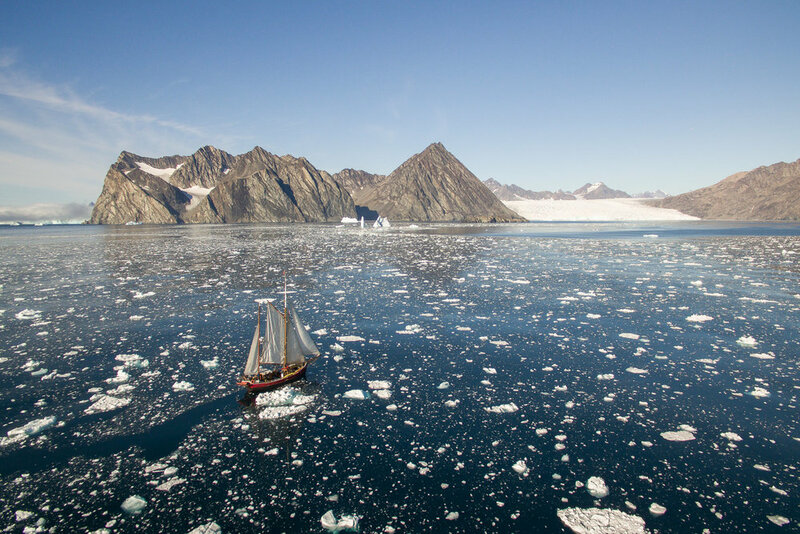 As with any exploration, the final sailing itinerary is decided once we set sail from Kulusuk Harbor, taking into consideration the weather and sea-ice conditions. August 26, 2019: Arrive in Reykjavik, Iceland this day (KEF airport code). Check into your hotel and meet in Reykjavik for a group dinner at 6:00 PM, so fly anytime this day or earlier. If you arrive early, there’s lots to do in Iceland’s capital city, and we will provide plenty of information for you. At our group dinner, you will meet Randy Hanna, your pro photographer and trip leader, and get to know your fellow photographers. We'll go through the itinerary for the expedition and about what you can expect on the trip. August 27, 2019: After breakfast and checkout, we will head to the airport and fly AirIcelandConnect from Reykjavik to Kulusuk, Greenland. 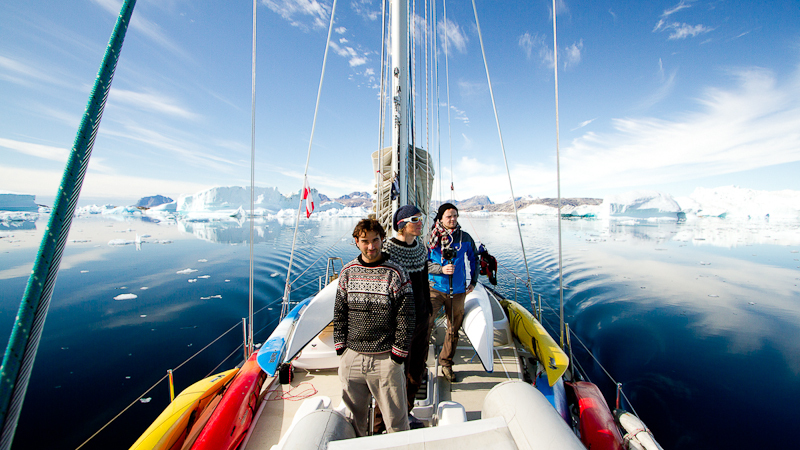 We will board Arktika and sail out of Torssut Sound toward Ammassalik Fjord, which has massive icebergs. 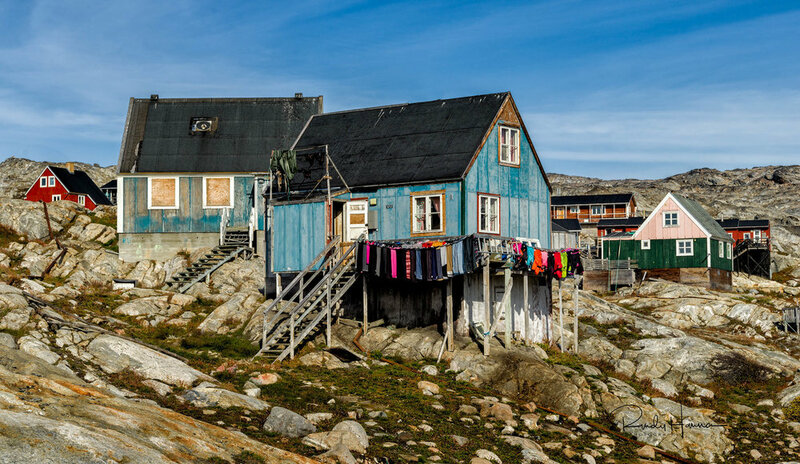 Weather permitting, we’ll continue to the town of Tasiilaq, the largest community on the east coast of Greenland with about 2,000 inhabitants. We’ll likely go ashore and explore the community, then move to our first anchorage and night aboard the sailboat. 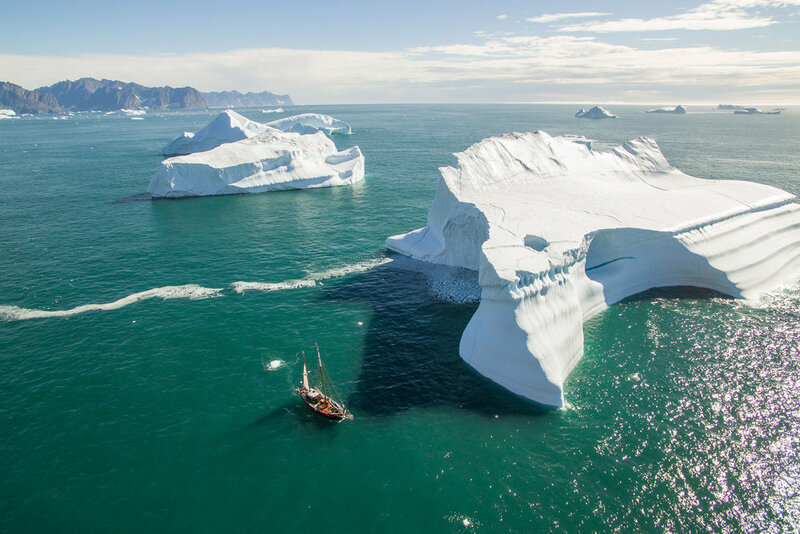 August 27–September 3, 2019: Aboard Arktika, we will explore a variety of East Greenland locations. We will likely travel into the great Sermilik Fjord and cross into Johan Petersen Fjord, an area offering numerous calving glaciers and spectacular photo opportunities. 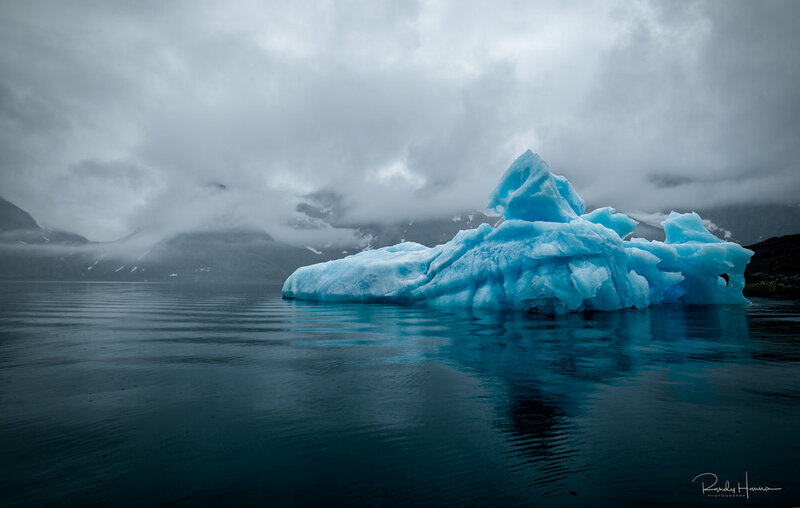 The fjords contain huge icebergs resulting from the calving. We also are likely see whales and seals, including narwhals, and with some luck, polar bears, Arctic fox, and many bird species. We may take a few hours to hike and explore unmarked terrain and villages on shore, such as Tiniteqilaq, where hunting, fishing, and tourism are the main income sources for the locals in this beautiful secluded area. We also may explore Sammileq, Tasiilaq, or Imiilaa fjords that offer calving glaciers and numerous dainty wild flowers. Throughout this time, we will be on the lookout for the Northern Lights, which are prominent during this time of the year. September 3, 2019: Our Greenland journey concludes as we dock in Kulusuk and say farewell to the Arktika crew. We fly AirIcelandConnect to Reykjavik, where we check into the hotel and gather for our last dinner together. The workshop concludes here and you spend your last evening exploring Reykjavik and packing for the trip home. September 4, 2019: Flights home anytime this day from Reykjavik (KEF). Air travel to/from Reykjavik, Iceland. Further air travel from Reykjavik to Kulusuk, Greenland (aboard specific AirIcelandConnect flight which we will tell you about). Passport and visa fees, if any. Tips for the boat crew. Alcoholic beverages. Items of a personal nature. Medical Evacuation Insurance (required). Travel Medical and Trip Cancellation Insurance (optional, but recommended). Anything else not listed as included. Your deposit of $4,000 will hold your space in this workshop. A second payment of $4,000 is due by January 1, 2019. The balance of $3,995 will be due not later than May 1, 2019. For this workshop, deposits and all payments are non-refundable, which is why you should have Trip Cancelation Insurance. All of our standard terms and conditions apply. Need special payment arrangements for your deposit? No problem, just ask us. If amazing landscapes and northern lights of Greenland and Iceland are on your list, look no further and click the "Sign Me Up! button now because this workshop is a small group and will sell out fast. See you in the The Arctic!